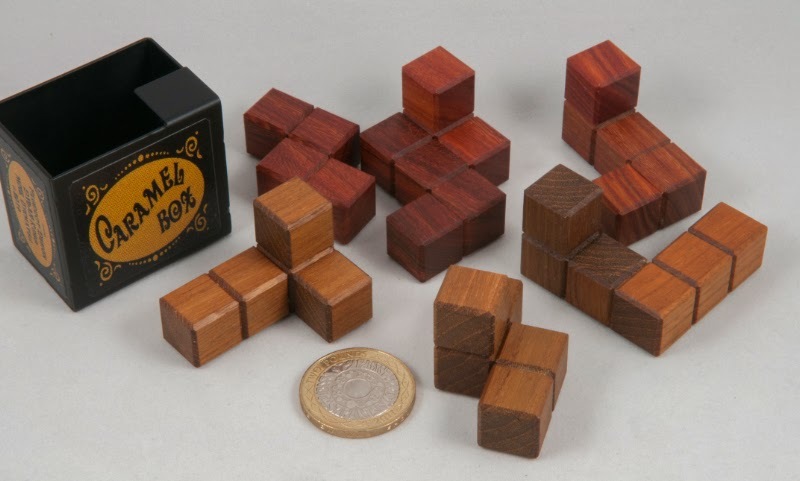 Mike Toulouzas makes some incredibly beautiful puzzles in a variety of glorious exotic woods… he tends to make them in reasonably small runs and as a result, they typically aren’t that cheap. Worth every penny in my humblest of opinions, but not cheap. So when Bernhard Schweitzer recently announced that would be stocking a collaboration between Mike and the New Pelikan Workshop, it sounded rather interesting. I asked Bernhard to reserve a copy for me and duly collected it at the puzzle party at IPP… and a while later I got to play with it. Let’s start with how it looks: smashing! Mike has taken care of the finer detailing work (think feet and handles) and the Pelikan guys have taken care of the rest – so it looks stunning and the fit is top-notch … and the price is jolly reasonable – Bernhard’s definitely hit on a winner with this particular combination of skills. Doors and Drawers is one of Mike’s early designs and broadly speaking you might be tempted to describe it as a framed three-piece burr… it might look like one, but if you treat it as one, you’ll take quite a long time to get anywhere on solving it! At first on of the drawers will slide out a bit and slide back in again… fun, but on its own, not all that useful. …and that’s the part with the high move-count… I managed to dispatch with the packing puzzle bits fairly readily, but found myself struggling over the course of several days with getting the doors and drawers themselves out of the frame. The key, as so often is the case was spotting some subtleties and making sure that they were all being used – time and time again I’d come reasonably close to getting a piece out, but then find myself right back where I started again. I like the fact that it took me several goes at it over a couple of evenings before I finally managed to remove the next piece – something that made the sense of victory taste a little sweeter for the earning of it. Reassembly is another serious challenge! Working out the eventual orientation is not a particularly big challenge… working out how to get them there through the 15-or-so moves is the real challenge. I must have got lucky on that bit because it didn’t take me nearly as long as the disassembly did… and slotting the final pieces of the puzzle into place rewards the puzzler with a neat looking little masterpiece. Vintage design from Mike with his lovely finishing touches and great work from the New Pelikan guys produces a terrific little puzzle – available from Bernhard at a competitive price. Read Kevin’s thoughts over here… spoiler alert: He likes it too! A few nights ago my puzzling mate Adin popped in for a bit of a chat and to drop off a puzzle I was taking off his hands. He’d posted a pic of some puzzles he was planning on putting on the next round of Cubic Dissection auctions and asked if anyone was interested in making him an offer for them in the meantime. I spotted his copy of Iwahara’s Confetto box in the pic and immediately asked if I could relieve him of it. He duly agreed and dropped it off a couple of evenings later, which gave me a great excuse to haul out the three crates of puzzles I acquired at IPP for a bit of a play… you see I’ve been a bit busy working on some post-IPP stuff and haven’t had much time to just play with the puzzles I’d recently bagged, but having a puzzler visit for the evening - I had the perfect excuse. 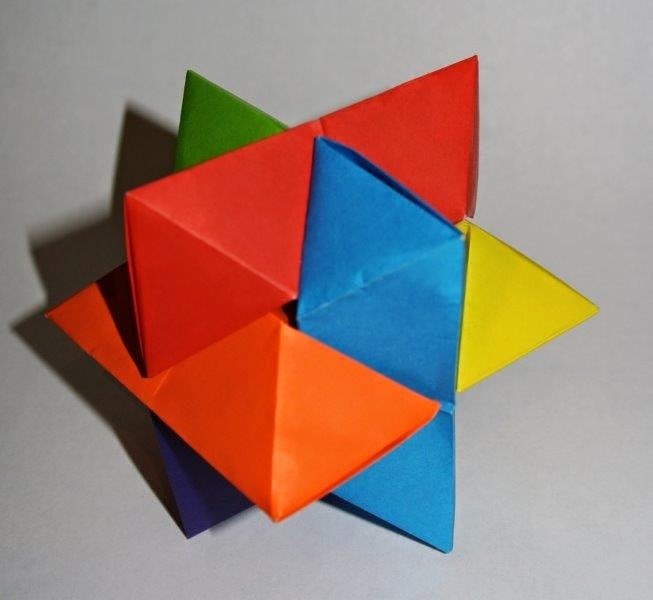 I’d played with Chris’ copy of Confetto a while back and remember being really amused (and amazed) by the mechanism. 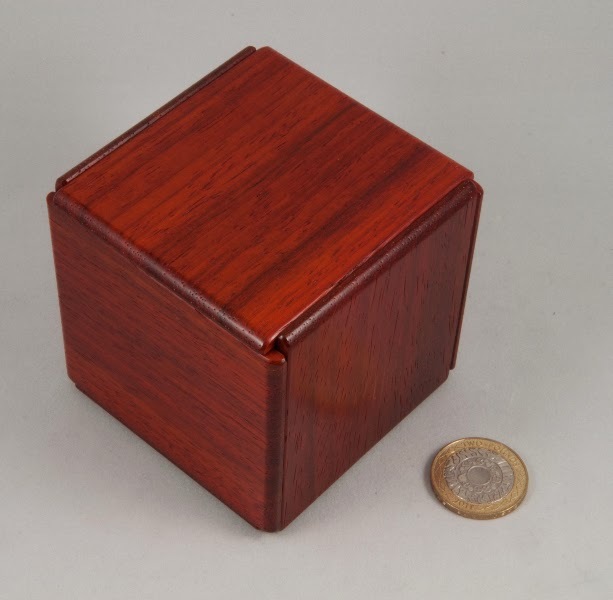 The box is cube-shaped and the description on the Karakuri web-site says that there are two compartments, one reasonably straight-forward and one a bit more tricky…and that sounds about right. 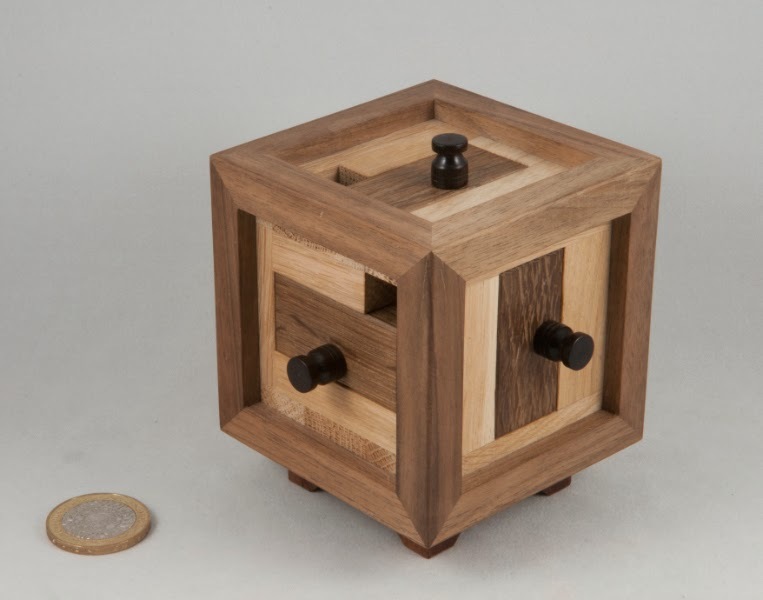 I’d venture to suggest that if you’ve never seen a puzzle box before you’d have the first compartment open in a matter of minutes, but the second one makes use of a rather clever twist and if you aren’t paying attention, you’ll miss any of the clues to it and you’ll spend ages and probably get nowhere. It was fun re-discovering the solution to the second compartment – I’d literally just remembered that the second compartment was trickier than the first when I picked up the box to play with it this time around. [I find I often ‘forget’ solutions to puzzles – except the most memorable tricks or A-HA! moments.] 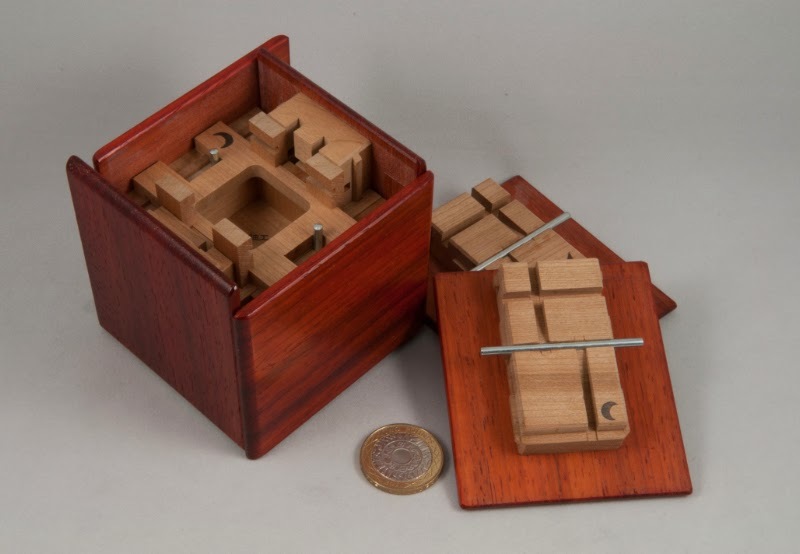 The first compartment was opened in a matter of seconds (don’t ever measure a puzzle’s value by how long it takes you to open it – it can only end in tears!) and then I started the real puzzling. Going backwards and forwards on the moves to open and close the first compartment might be satisfying but won’t give you a lot of clues unless you try something a little different, and then, if you’re paying careful attention you’ll spot a clue to how to get into the second compartment – work out how to use that properly and you’ll find your way into the second compartment. Mercifully it didn’t take me too long to find my way into the second compartment wile Adin was there so didn’t embarrass myself too much, on that puzzle at least. This time I had significantly more success and now I understand why Chris was so enthusiastic. At its heart, Amulet is “just” a six-piece burr with different length pieces in one axis – the twist comes from a series of blocks attached to the pieces that give the pieces shoulders that interfere with adjoining pieces… and those little blocks make things very interesting indeed… so I duly added some enthusiasm to the Amulet bucket and I’m hoping that Adin will find some time to knock up a few more copies because I think more people should get the chance to have a play with one of them. Adin also left me with a rather well made origami diagonal burr as a gift – thanks mate! Caramel Box was a big hit at this year’s Nob Yoshigahara Design Competition, taking a Top Ten Votes Award for its designers, Mineyuki Uyematsu and Yasuhiro Hashimoto, while it amused a shed-load of puzzlers. I’d had a fiddle around with the competition entry and didn’t get very far at all, so when I spotted a few copies on Mine’s table in the puzzle party, I grabbed one. 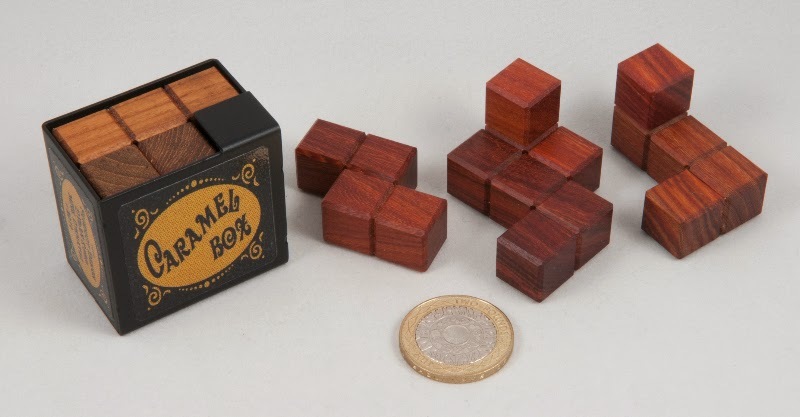 Caramel Box makes a brilliant pocket puzzle – two sets of wooden blocks each need to be placed inside the sheet metal box and the whole she-bang will easily fit in your pocket. 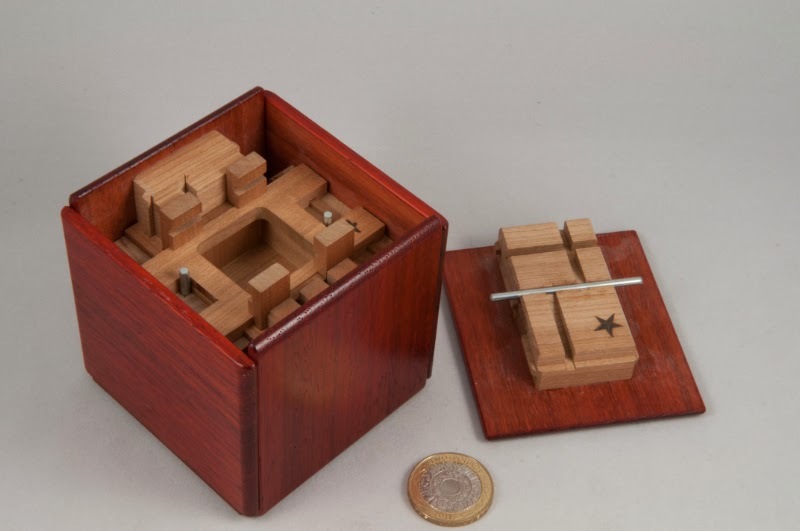 The box encloses a 3*3*2 space and has an opening across the top (a 2*3 side). The only possible problem to get in your way is a single overhanging square in one of the corners. All you have to do is place each set of three pieces (both of which form a solid a few cubes shy of the required 3*3*2) inside the box so that they aren’t protruding out of the open end… how hard can that be? Picking a set of blocks to start with (they’re different colours so you don’t unwittingly end up with a set of mismatched blocks) I decided that the best attack would be to find a 3*3*2 assembly outside of the box and then set about trying to work out how to get that assembly into the box – finding an assembly wasn’t too tough, but then exploring how to get it inside the box generated quite a few alternative orientations and rotations… sadly the first several assemblies didn’t turn out to be particularly productive, so I switched strategies and focused instead on getting to an assembly that worked inside the box. Either I got lucky, or it turns out this is a more productive strategy, as I managed to reduce the number of alternatives I needed to consider quite significantly and indeed stumble across a solution to the first set of pieces in a matter of minutes (pity I spent more than an hour on the less productive approach!). Finding the first solution was a very rewarding “A-Ha!” moment – with a number of moves required to successfully manoeuvre all of the pieces into their correct spots to allow the final piece to settle into place. Fresh with a victory under my belt, I swapped to the second set of pieces and expected to find a solution in a similar amount of time… only to realise that there’d probably been a fair amount of luck involved in my first solution. 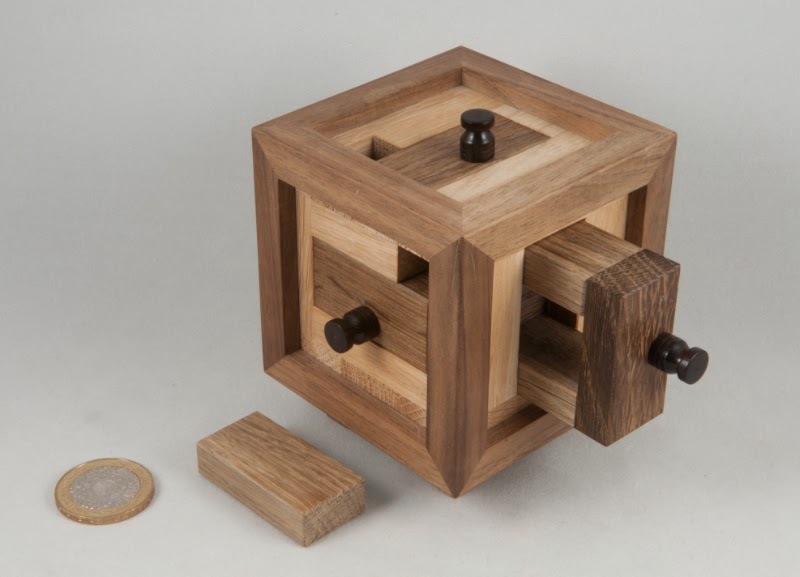 This is one of those deceptively simple little puzzles – everything's on show and there are only a couple of pieces to contend with, yet it provides a pretty decent challenge – and the fact that it’ll fit in your pocket makes it dead easy to lug around to torment others with… it’s a great puzzle.